Coal Creek is a recreation of a Coal Mining town in the 1870's. Set on 32 acres of bushland with over 50 buildings. Coal Creek is a recreation of a Coal Mining town in the 1870's. Set on 32acres of bushland with over 50 buildings. Coal Creek Community Park and Museum exists to promote awareness and understanding of the natural, industrial and social history of South Gippsland from pre-European settlement through to 1920, through the collection, preservation and communication of relevant cultural material. 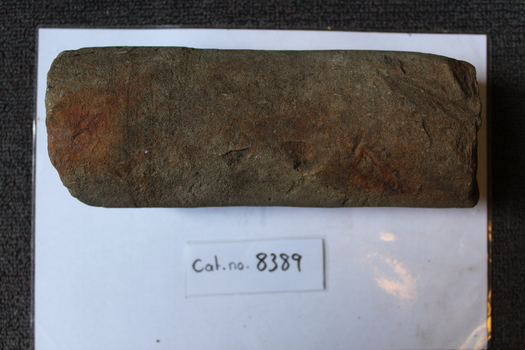 8389.1 - Drill core sample, seems to be weathered. 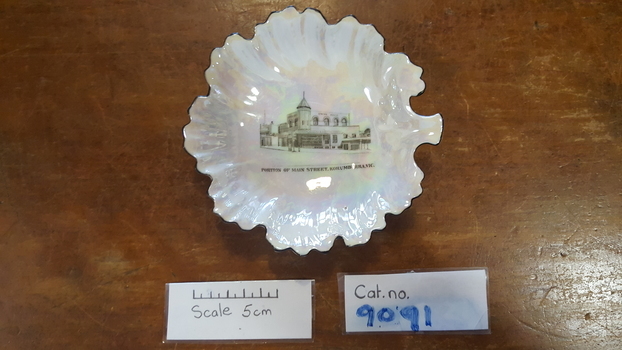 Iridescent white china butter dish in the shape of a fig leaf, with a transfer of a drawing of Korumburra main street on it. Needlework Sampler - School work 1907. 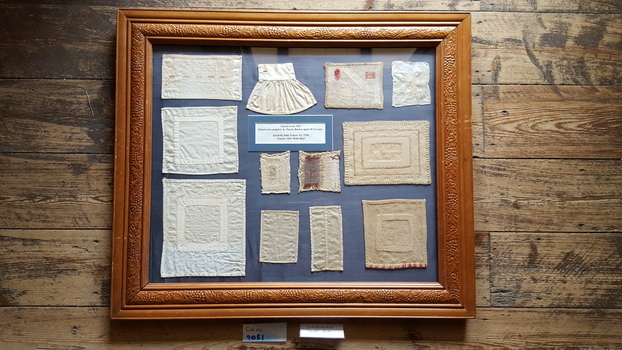 12 needlework samplers framed in a wood frame. School work 1907. Hand sewn samplers by Dorrie Barnes, aged 10-12 years. Kardella State School No 3196. 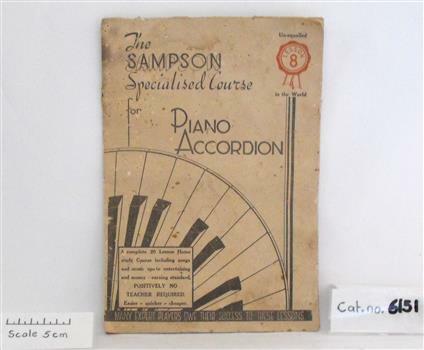 Bone coloured paper book with circular design of piano accordion keys, "The Sampson Specialised Course for Piano Accordion." A Complete 20 Lesson Home Study (Lesson 8) This registration is part of collection Reg. 6142 - 6150. 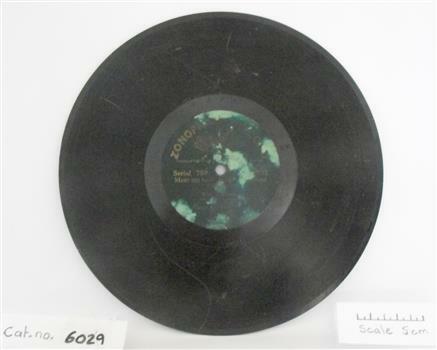 Phonograph record, black shellac with green Zonophone 'The Twin' label. A side: Prettiest song of all. B side: Par Ci Far La. Artist: Mr James Lent playing English Bells, with orchestra. 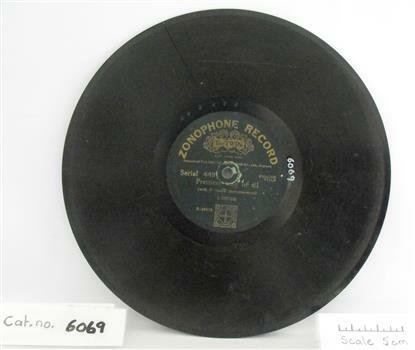 (2) music sheets glued onto cardboard, from Brass Band Journal No.58 Titles: "Neck or Nothing" and "Everybody's Doing it Now"
Black vinyl phonograph record with a green "Zonophone, The Twin" label. Side A: I like Your Apron and Your Bonnet, Side B: Meet Me Tonight in Dreamland, English Bells played by Billy Whitlock with orchestral accompaniment. Brass 'x' shaped folding frame with centre axle, ridges down one leg of stand with a pin on side of one top plate to adjust opening width. Used by Manning Chemist, Flinders Street Railway Station, Melbourne for folding individual powder portions into paper packages until 1984. On top plate : British Made. 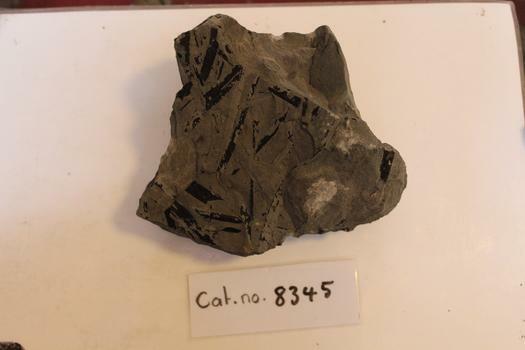 8345.1 - Large, roughly trapezoidal prism of mudstone, one large face showing several leaves (phyllopteroides? ), opposite face showing one partial; leaf and what appears to be a piece of confer foliage- stem and leaves. Rectangular aqua tinted clear glass bottle with angled corners for stopper seal with embossed text on side and base. On side 'ENO'S FRUIT SALT'. On base 'M'. Hexagonal clear amber glass bottle, 1/2 full of viscous liquid and cork stoppered. Three plain sides, a single side with embossed text, between two sides with stippled 'x' pattern. 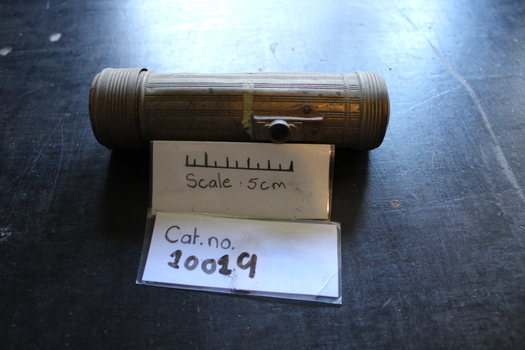 Letters and numerals embossed on base and paper label adhered to plain side. Segen's Medical Dictionary. © 2012 Farlex, Inc. : 'Carbolic Oil : Phenolated oil, an obsolete preparation of phenol in arachis acid formerly used as a local (skin) anaesthetic; the caustic phenol was replaced by glycerine'. TROVE : The Argus (Melbourne, Vic. : 1848 - 1957) Saturday 17 November 1877 p 11 Advertising PATENT ZELTZOGENE CHARGES, D. FEVRE. In boxes of ten charges, price 6s. per box. 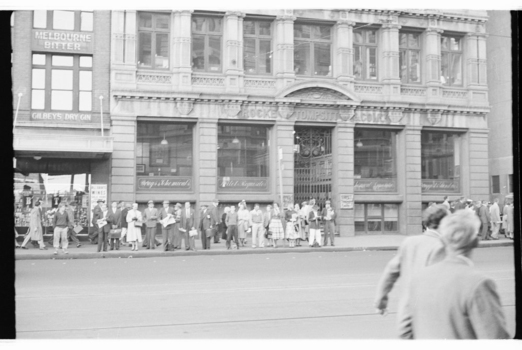 Wholesale agents, Rocke, Tompsitt, and Co., 3 Flinders street east. TROVE : ''Rocke Tompsitt Pharmaceutical wholesaler Rocke Tompsitt and Co Ltd has returned to the profit list after recording a $20,381 loss during 1976-77. However, annual dividend has been reduced from 3.5c last year to 2.5c. The group announced yesterday an after-tax profit of $312,000 after sales of $27.09 million, up 26.8 per cent. 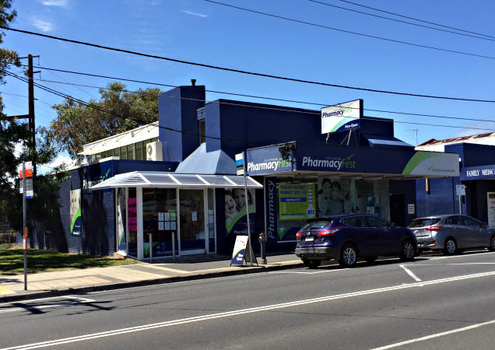 Directors said the improvement in the profit had come from the return to profitability by the Victorian wholesaling company, and the inclusion of the profit from the T. G. Cullum group for a full 12-month period. They said the company's other subsidiaries had continued to trade profitably. The group had continued to operate profitably despite excessive government price control over drugs in pharmaceutical-benefit scheme. However, the directors were optimistic that a satisfactory result would be achieved in the present year. Embossed text on side of bottle 'NOT TO BE TAKEN'. Embossed on base '4' over '4 OZ' over 'AGM'. Paper label with a section of the left side missing. White paper with dark blue text, overprinted with red text ('CARBOLIC OIL'), contained within a broken line border. 'THE CHALLENGE CARBOLIC OIL containing not more than ......per cent of Phenol. POISON for external use. Contents approx'tly 4 fld. oz. 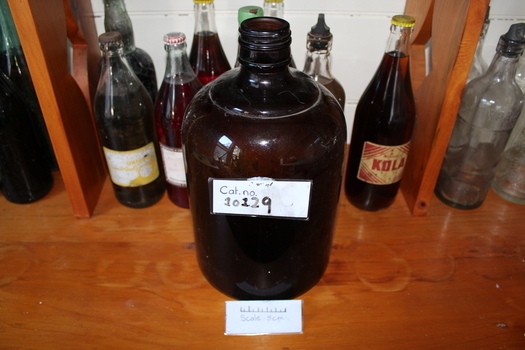 used as a dressing for................Burns, Wounds & .......... TOMPSITT & CO PTY LTD MELBOURNE'. 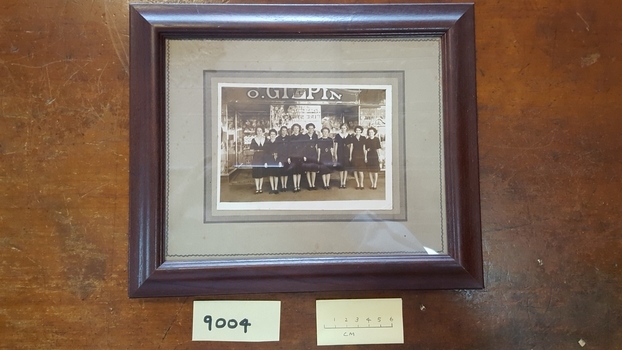 This photo is reproduced in the book on Oliver Gilpin's life by his granddaughter Muriel Perry, titled 'Just a pocket for the money', 1995, p.84. The staff names have been labeled as 'Kath? (M), E.Myles, M.Haly, D. Walker, V.Bond, I.Christensen, L.Mattinson, D.Shipsides, J. Miles, '(Coal Creek Historical Village per I. Devlin) Note : (M) Abbreviaton for Manager. on back of frame: Dimboola, 1935? 8 thick metal strips with regularly-shaped holes, likely to secure the rails to the sleepers in the mines. Rusted Lid Faded Sticker with a yellow border and writing. 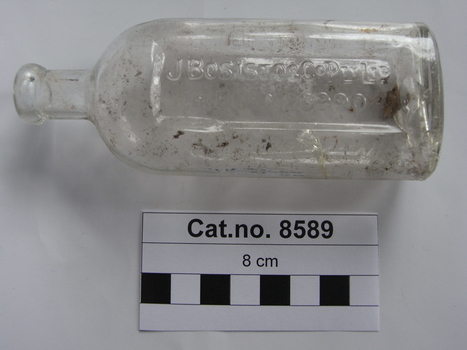 Hexagonal clear amber glass bottle, 2/3/ full of viscous liquid and cork stoppered. Three plain sides, a single side with embossed text, between two sides with stippled 'x' pattern. 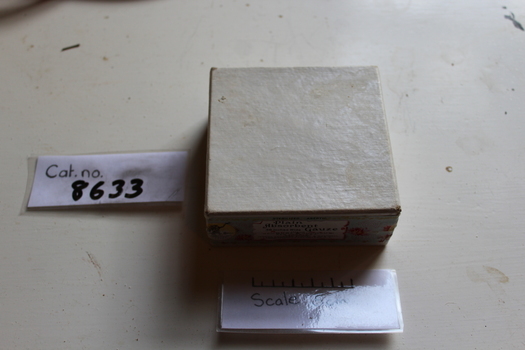 Letters and numerals embossed on base and paper label adhered to plain side. Embossed text on side of bottle 'NOT TO BE TAKEN'. Embossed on base '4' over '4 OZ' over 'AGM'. White paper label with dark blue text, overprinted with red text ('CARBOLIC OIL'), contained within a broken line border. 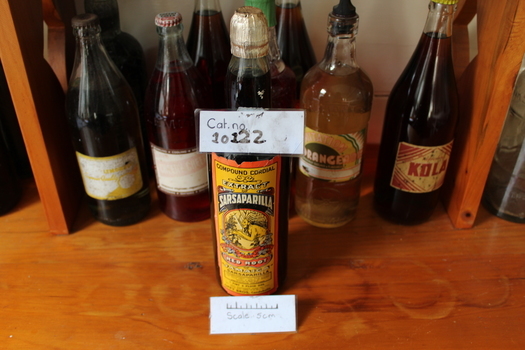 'THE CHALLENGE CARBOLIC OIL containing not more than 3 per cent of Phenol. POISON for external use. Contents approx'tly 4 fld. oz. 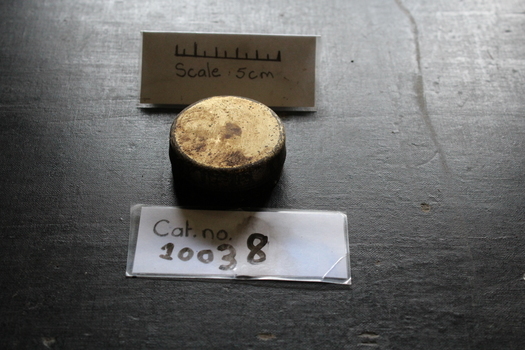 used as a dressing for Scalds, Burns, Wounds & c. ROCKE, TOMPSITT & CO PTY LTD MELBOURNE'. Plug of tobacco in yellow, black and red coloured paper package with text on it. Perfection, Selected Virginian, Ready Rubbed Fine Cut Tobacco. 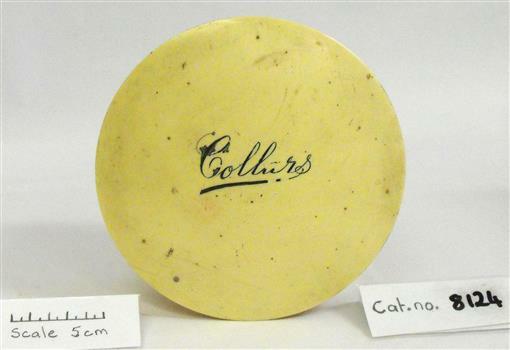 A round bone-coloured Bakelite collar box with lid. The word Collar in black copperplate lettering on the lid. Oval in section, aqua tinted clear glass bottle with text embossed on side panel. Cork stopper in bottom of bottle. 'J. BOSISTO & Co PTY LTD REGD No 3990' on side. Rectangular shaped tin with hinged lid, label coloured brown green orange, yellow, red and off-white, depicting a standing man holding something up and text. 8709.1 - This Remington typewriter is panted black and has a couple stickers on it with company details. 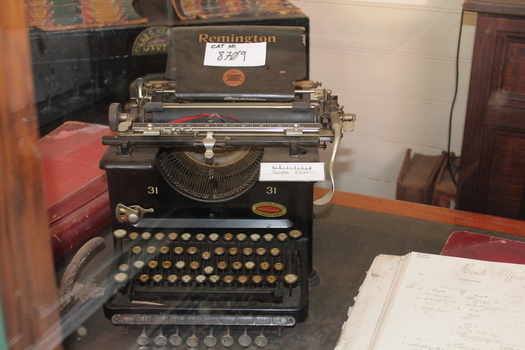 8709.1 - Remington - CHARTRES PTY LTD - 31 - Remington House - TO SAVE TIME IS TO LENGTHEN LIFE - STANDARD - Remington Typewriter - TRADE MARK REG - U.S PAT OFFICE - 375-377 Collins St Melbourne - Remington House. 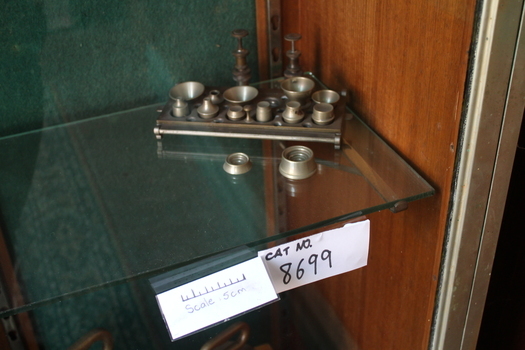 8699.1 - Metal nesting scale set housing. 8699.2 - Nesting scale piece. 8699.3 - Nesting scale piece. 8699.4 - Nesting scale piece. 8699.5 - Nesting scale piece. 8699.6 - Nesting scale piece. 8699.7 - Nesting scale piece. 8699.8 - Nesting scale piece. 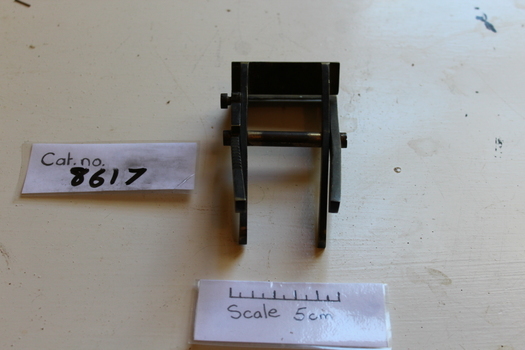 8699.9 - Nesting scale piece. 8699.10 - Nesting scale piece. 8699.11 - Nesting scale piece. 8699.12 - Nesting scale piece. 8699.13 - Nesting scale piece. 8699.14 - Nesting scale piece. 8699.15 - Nesting scale piece. 8699.16 - Nesting scale piece. 8699.17 - Nesting scale piece. 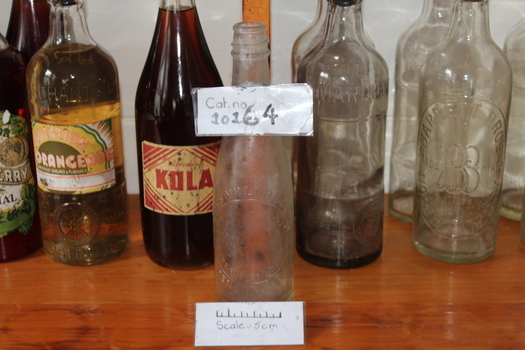 Hexagonal clear amber glass bottle, 3/4 full of dark coloured liquid with bakelite screw top, paper label adhered to bottle. 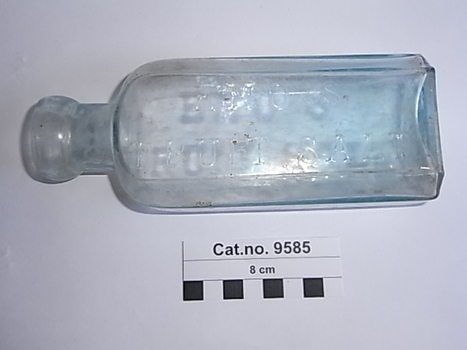 Bottle has 3 plain sides, 2 sides with 'x' stipple pattern either side of a panel with embossed text. Base of bottle with embossed monogram, letters and numerals. Embossed on side of bottle 'NOT TO BE TAKEN'. On base of bottle '7' then AGM monogram, then 'M' over 'F1072'. 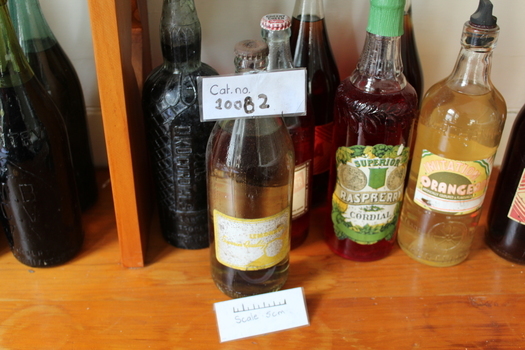 White paper label with red printed text 'CAUTION - NOT TO BE TAKEN', below in black typewritten text 'THE PAINT 28-8-62, Use as directed. Mr. Williams', below in red printed text 'CHELTENHAM & DISTRICT U.F.S. DISPENSARY. 272 CHARMAN ROAD. TELEPHONE XF2352'. 8689.1 - Tall wooden table with slant for proper ergonomic drawing posture. 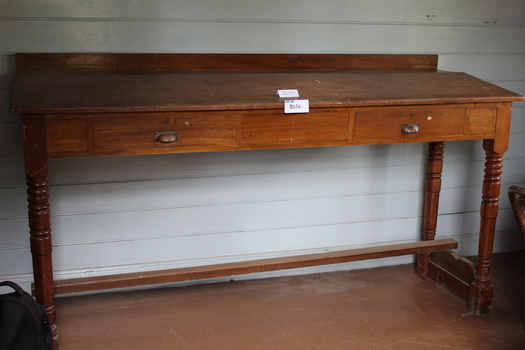 8689.2 - Wooden draw with metal handle and key hole. 8689.3 - Wooden draw with dinted metal handle and a key hole.